You'll be surprised by some of the celebrities with alleged ties to the mafia, the crime bosses, mafiosos, mobsters, and gangsters. Of course, there are the obvious actors who've played mafiosos, people like Al Pacino and James Caan. They're the kind of actors who may have gotten deep into their characters by hanging out with actual mobsters... "Method Acting." But this list also includes people who you wouldn't expect, like English bombshell Elizabeth Hurley. What has she been doing with mobsters? Does the mafia really like the 2000 film Bedazzled? Was their relationship the inspiration for Mickey Blue Eyes? And, furthermore, what was the mafia doing with Tito Puente? Did they just really need someone to play the vibraphone at a mob function? It's important to remember these relationships haven't been confirmed, these are just celebrities who have been rumored to have mafia connections. Perhaps they got connected because they went to the same birthday party. Or maybe it's something more sinister. Maybe Wayne Newton's success in Las Vegas will require him to pay a few favors out to the mob? Let your imagination run wild with this list! 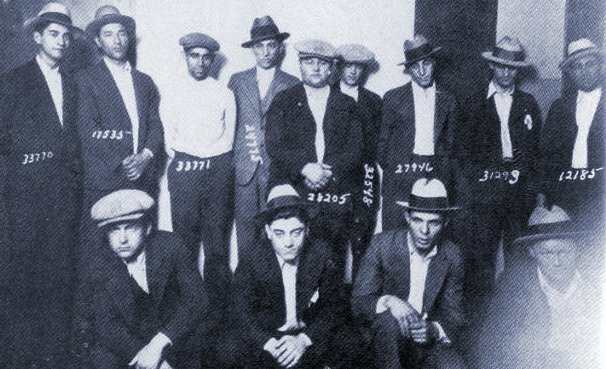 Frank Sinatra's uncle, Babe Garavante, was a member of the Morettis and was convicted of murder in 1921 after driving the getaway car from an armed robbery. Over the years, Old Blue Eyes was consistently tied to the Gambino, Genovese, and Colombo families. Marilyn Monroe allegedly spent her last night alive with gangster Sam Giancana in Lake Tahoe, CA. That night, he supposedly convinced her not to go public with her affair with JFK. The next day, she was found dead of an apparent suicide. The Four Seasons frontman has ties to the Genoveses. He admits the connections: "Where I grew up, in New Jersey, there was a lot of organized crime activity. It was a part of life." If you were an entertainer in the 60s, you'd rub shoulders with mob guys all the time; they owned most of the clubs. This football personality has been connected to both the Gambinos and the Luccheses through his seedy Upper East Side bar, Bachelors III. So many bookies, loan sharks, and mobsters came through the doors that the NFL ordered Namath to divest himself from the place.